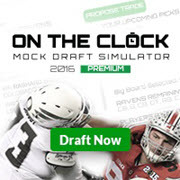 Drafttek.com uses some unique positional codes. Teams may have specific needs in what they look for in certain positions - we provide position sub-groupings to help out in this regard. Here are Positional Definitions for the sub-groups that we use. Drafttek.com's Big Board of 2017's top NFL draft prospects is compiled by our internal staff of talent evaluators. The NFL draft prospect rankings are adjusted regularly during the NCAA Football season. The Big Board also undergoes an adjustment process during post-season All-Star games, the NFL Combine workouts, and individual campus workouts. Click HERE for explanation of our terminology. Due to systemic issues, the "change" (up/down movement since the previous Big Board revision) column could not easily be updated.